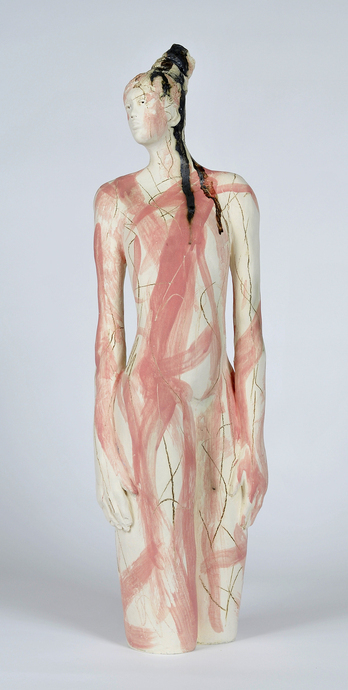 The primary concerns within my practice are describing aspects of the figure through a combination of the drawing process and ceramic sculpture. Life drawing has always held a fascination for me and in particular the eventual emergence of the figure from a network of marks made on paper. Through a contemporary approach to the figurative form and transferring these qualities to the ceramic surfaces, the figures are provided with a similar energy and life. My current body of work explores notions of ‘presence’, and in particular my own existence in the world. Using my own body as the model and drawing through the sense of touch alone strange and unfamiliar figures began to emerge from the unconscious, spontaneous, and vigorous marks. A heightened awareness of the body led to a feeling of exaggerated scale such as the torso feeling large whilst the head appeared small. These sensations together with the rhythms, weight and tensions of the highly graphic surfaces give the figures a familiar yet unfamiliar appearance.